Kayi Kayi Nampitjinpa was born in 1946 at Kiwirkurra, northwest of Alice Springs. 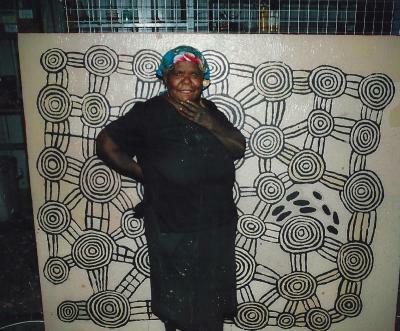 Today she lives in Kintore, with other painters of the Pintupi community. Together with her family she moved here in the 80s when many Pitupi from the Papunya reserve returned to their traditional living areas. Although she is already in her sixties, Kayi Kayi is regarded a young artist, especially since she only began painting in 1996. She is part of a second generation of female artists, most of whom already had many years of experience assisting the first generation of male painters from Papunya. These women started to emerge from the shadows of the men in the second half of the 80s and developed a sophisticated, unique and refined style. Kayi Kayi has the custodial rights to paint the sacred and secret Tingari Dreamings (stories) relating to her country Kiwirkurra. The Tingari were a group of mythical creatures from the Dreamtime who traveled vast stretches of desert, performed sacred rituals, taught law and shaped and created particular features in the landscape. The distinct style of Kayi Kayi gives these stories a unique perspective. She paints primarily rock hole dreamings and places and ceremonies associated with women.